How and Why Should You Link Your Aadhaar Number with Mutual Fund Investments? Haven’t linked your Aadhaar to Mutual Fund folio yet? Here are the step-by-step offline and online methods for the process of seeding. India has seen Aadhaar in a pivotal role not only to establish an individual’s identity but also in the financial landscape. In line with the recent amendments to Prevention of Money Laundering Act (PMLA) rules, 2005, the government has now mandated the mutual fund houses to obtain their investors’ Aadhaar number and link it to their respective accounts. The mandate is not only for the mutual fund investments; it is applicable for a host of financial instruments such as bank accounts, insurance, etc. Targeting to cut down the corruption and irregularities in the financial sector, the government has instructed the AMCs to link all the investment documents with the 12 digits unique Aadhaar number by March 31, 2018. The step has been taken to curb the continuous inflow of unaccounted money into mutual funds. Linking mutual funds with Aadhaar is a one-time process. In this perspective, we have tried to cumulate all the methods of linking your Aadhaar number to your mutual fund folios in short, simple, and hassle-free way. Remember that “Y” in the typed message sent by you asserts your consent to link your 12–digits UIN to all the mutual funds serviced through Karvy. With the advancement of technology, the process of linking your Aadhaar number and mutual fund investments has become as easy as taking a sip of coffee. 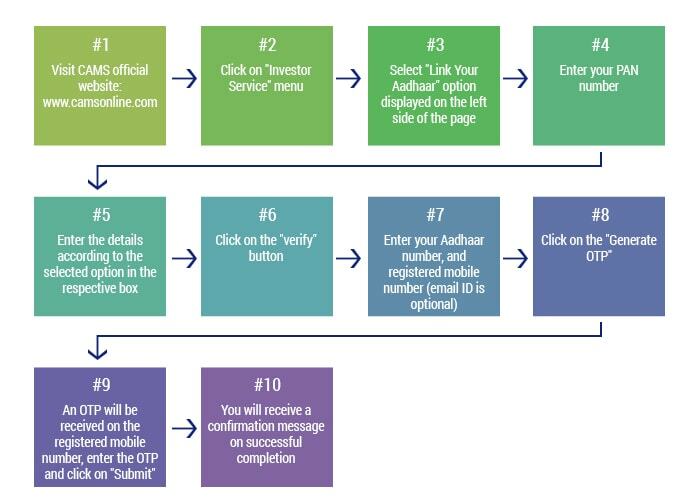 To initiate the process online, you just need to ensure that the phone number registered with your Aadhaar is operational. This method gives you the flexibility to carry out the linking process with mutual fund registrars avoiding the hassle of visiting the fund houses individually. The process of linking will be considered successful only when the details like the name, date of birth, gender, and all other information matches correctly with the Aadhaar information furnished by you. In case there is any mismatch, you will have to re-enter your details and follow the entire procedure all over again. Why Is Linking Your Aadhaar Details with Mutual Fund Investments Necessary? If you fail to link mutual fund folio with Aadhaar, your fund account can cease to be operational. Furthermore, you won’t be able to invest new amounts or withdraw money from the same fund until the linking process is completed successfully. Is Aadhaar Details for All the Account Holders Required? Yes, for a mutual fund investment having more than one account holders (First Holder, Joint Holders, Guardian (in case of Minors), Power of Attorney (POA) Holders, and Donors (in case of Children’s schemes)), Aadhaar details of all the holders should be linked to the folio. How Can NRIs, Non-individuals, and HUFs Link their Aadhaar and Mutual Fund Investments? NRIs are not eligible to enroll for Aadhaar. Hence, they are not required to submit Aadhaar information. While for HUF, Aadhaar information of Karta is required. However, non-individuals can complete the linking process through Karvy’s website. Those investors have to submit the Aadhaar number of their authorized signatory/ies. When Should I Submit my Aadhaar? You must submit it as early as possible. What Should I Do In Case I Don’t have an Aadhaar? You must apply for an Aadhaar by visiting any authorized Aadhaar Enrolment Centre. I Have Applied for an Aadhaar Card but Haven’t Received it Yet. What Should I do? In such case, the proof/receipt of the enrolment for Aadhaar can be submitted. However, the actual Aadhaar number is required to be furnished for eventual authentication within the 6 months from the date of submission of the proof of enrolment, failing which the account/folio shall cease to be operational. Can the Linking Process be Done Through Mutual Fund Distributor? Yes. The linking process can be accomplished through a mutual fund distributor. What Should I do if I Hold Mutual Fund Units in Demat Mode? You can easily link a mutual fund in demat form by approaching the depository participant and need not visit the registrars or fund houses. For more assistance regarding this or any other information, contact MySIPonline.